There have been many damsels in distress rescued by brave knights or other male adventurers over the years, but the tables have turned in Benjamin Rommel Games' Monkeys & Dragons, a retro-styled point-and-click adventure to be released on Steam Early Access later this year. The honeymoon of newlyweds Jack and Lana had barely begun when Jack was "kidnapped by a sorcerer who turned out to be Jack's ex-boyfriend." 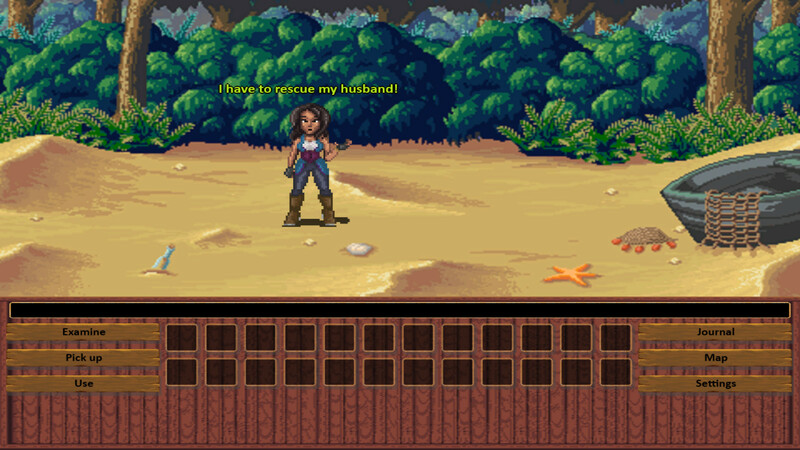 With no one willing to assist her in rescuing her husband from "a tropical island full of monsters and mysteries," it is up to Lana to embark on an adventure full of quests to complete and "dangerous puzzles" to solve. Intrepid as she is in confronting a dragon and protecting the innocent, however, something occurs along the way that even she isn't prepared for. Inspired by genre classics such as Monkey Island, Indiana Jones and Simon the Sorcerer, the game is presented in lovely retro-styled pixel art, as seen in the first screenshots and trailer released. A sizeable section at the bottom of the screen will be filled with the inventory you collect to overcome obstacles along the way, a simplified verb-based interface to examine, use and pick up items of interest, and links to handy map and journal features. The first three of five planned chapters of Monkeys & Dragons will be launched on Steam Early Access for Windows PC in December. After eight weeks, the developer intends to use player voting feedback to determine how the rest of the story should play out, whether finishing with a romantic ending, a tragic one, or even a complete twist previously unforeseen. Whatever the result, the final version of the game should be ready within an additional four months. Jack and Lana had just started their honeymoon when Jack was kidnapped by a sorcerer.